As Nobel season dawns upon us, Stu Cantrill points me to an endlessly interesting link on the Nobel website which lists nominating information for various scientists up to 1964 (names of nominees and nominators cannot be revealed for 50 years). Since many more deserving scientists never win the prize compared to those who do this list makes for especially readable material. For instance Carl Djerassi who never won the prize was nominated three times (only until 1964 though, so he was likely nominated many more times after that). In the peace category Franklin Roosevelt was nominated 5 times. And Lise Meitner was nominated 47 times without winning in both the physics and the chemistry categories. The astonishing statistics are for everybody's favorite chemistry demigod R B Woodward. Woodward was nominated a record 111 times from 1937 until 1965 when he finally won. What's even more stunning though is the year of his first nomination - 1937. That can't be quite right since Woodward was 20 years old then and about to finish his PhD at MIT. Interestingly there is no name in front of the nomination so this could be a mistake. But there's little doubt that nominating even the precocious Woodward at age 20 would have been premature to say the least (Note: Woodward famously finished both college and graduate school in four years and had to drop out for one semester for neglecting other subjects). The more authentic nomination still comes in 1946 when he was still only 29: this time he was nominated along with his colleague Bill Doering by the astronomer Harlow Shapley. 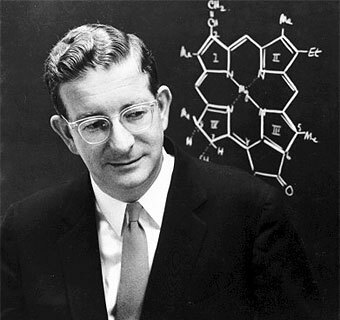 The nomination was clearly for the Woodward-Doering breakthrough synthesis of quinine. After 1946 Woodward was nominated pretty much every single year by multiple people. In fact looking at the list what's astonishing is how he didn't win the prize until 1965. You can have more fun looking at the list and especially searching for other famous chemists who should have gotten a Nobel Prize but who never did. For instance Gilbert Newton Lewis is widely considered to be the greatest American chemist to have never won, and he was nominated 41 times so one wonders what exactly kept him from being on the list. C K Ingold, one of the fathers of physical organic chemistry, also never won and he was nominated 63 times. On the other hand, Robert Robinson with whom Ingold enjoyed a friendly rivalry was nominated 51 times but actually won. Another interesting fact to be gained from the database is the number of times a particular Nobel Laureate nominated another scientist. In what is a testimony to his well-known generosity of spirit for instance, Niels Bohr nominated other scientists 25 times (this included multiple nominations for Lise Meitner who unfortunately never won). Woodward on the other hand nominated someone only once - Linus Pauling in 1949. Interestingly, Woodward had tried to apply for an instructorship at Caltech in 1942 when Pauling was the chairman of the department but as the letter below indicates, Pauling didn't seem too interested; one wonders how the course of American and Caltech chemistry would have been had both Woodward and Pauling reigned over the world of chemistry from the same department. In any case, the nomination website makes for very intriguing browsing with which you can play around for a long time. The one thing it makes clear is what we already know - that the number of outstanding Nobel-caliber scientists who will never win the prize far outweighs the number who actually do. That fact should put the nature of the prize in the right perspective. I had not noticed that - good catch! Even Marie Curie would have found that hard to pull off. The answer to your question about Lewis is to be found in Patrick Coffey's excellent book "Cathedrals of Science". Nerst screwed him.. Thanks - I have heard of it and will take a look! 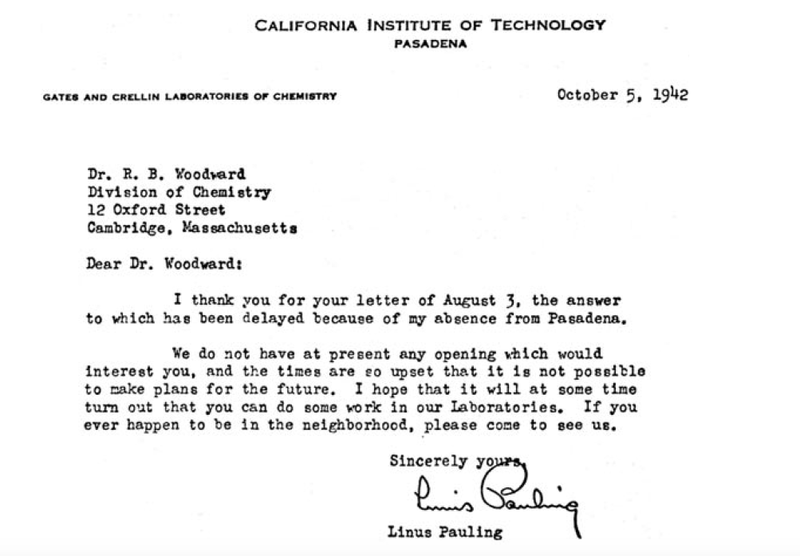 I am completely making up this thing up but there might be a personal or political reason for Pauling's reply. Here is why I think so. From his biography and other technical (history of chemistry etc.) type of articles, I have learned that he had several problems with several scientists throughout his career. Most of them were due to Pauling's political stand and/or others' actions on political issues. I am about to finish a book called "Up from Generality: How Inorganic Chemistry Finally Became a Respectable Field" by Jay Labinger. I think it is an incredibly important book. The chapter where Pauling's administration was told especially made me think that he probably had something in his head that he didn't want Woodward. This is again totally my theory, but I tend to believe it now. Anyway, I know you are more interested in organic and physical aspect of chemistry but I suggest you read this book since you are very interested in personal relationships between chemists. The book is full of them. It's very short (~70 pages) and takes only 2 hours to read the most. It's expensive, so if you just want to read it, I'd be happy to send you my copy (we're in the same city) to read.